The CD-RW900MKII is a professional CD recorder with a new commercial grade TEAC tray-loading transport ensures years of reliable operation in the most demanding installations. The new transport also allows gapless recording when setting track marks, something not possible using off-the-shelf PC optical drives. 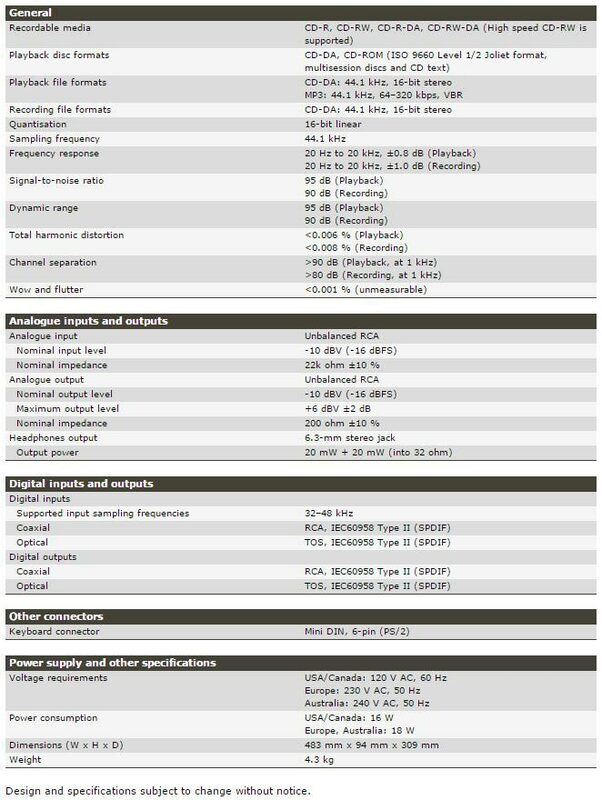 A high-performance codec chip is used for A/D and D/A conversion for clean, clear sound quality with a frequency response of 20 Hz to 20 kHz ±0.8 dB. Various recording features like automatic track creation help the operator create polished recordings without constant supervision. The CD-RW900MKII has unbalanced analogue input/output jacks as well as optical and coaxial digital audio connectors. Both the left and right analogue inputs have their own gain controls on the front panel. In addition, the digital input can be controlled for optimal recording levels from a digital source. Functions including auto-cue, auto-ready, pitch control, power-on playback, and fade-in/fade-out playback are provided. It is also possible to control the transport via an optional computer keyboard. Whether used for mobile or fixed installations, the CD-RW900MKII is a great choice for reliable CD recording and playback. See also the Tascam CD-RW901MKII version which comes with balanced analogue input/output, optical and coaxial digital audio connectors and external control terminals.